Dr Clifford Leen, Western General Hospital. Chris - TB has been virtually eradicated from the UK and a whole generation have had hardly any contact from it so it's easy for us to forget what a disparaging and serious problem it was for us in the past. A serious killer disease, but now we're seeing something of a resurgence and not just a resurgence of any old TB but forms of the bacterium which are drug resistant. Dr Clifford Leen is a physician of infectious diseases at the Western General Hospital. Chris - So tell us about TB. What actually is TB, for a start? Clifford - TB is a disease caused by infection of a bacterium. Mycobacterium tuberculosis. Basically, you get exposed to the germ and there's a timed delay before your symptoms would appear. There's a latent period of some sort. It can affect the lungs primarily but it can also affect other parts of the body like the brain, the kidneys and the gut and also the bone and joints. 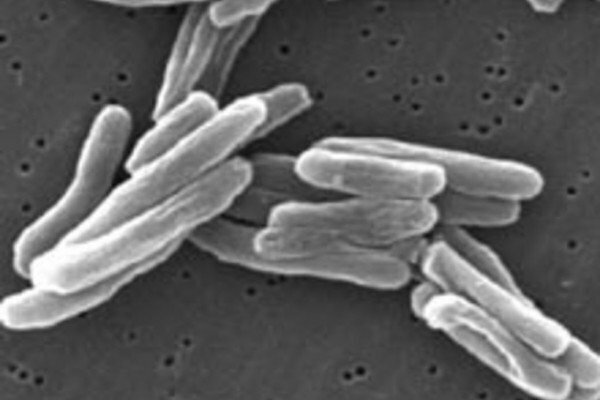 Chris - Is it true in the case of TB that coughs and sneezes spread diseases? Is that how it gets around? Clifford - It certainly does. It is spread by aerosol route and aerosol can float for a bit before people inhale them. Chris - Someone with TB, active open TB is coughing. You walk in to the cloud of droplets they've just coughed out, breathe them in - then what happens? Clifford - The person may well be infected. The disease doesn't happen to everyone who inhales this droplet. Chris - Do you clear the bacterium from your body or does it stay in you? Clifford - Some patients clear it and others it stays in you and could be dormant for many years then reactivate when the immune system gets a bit weak. Chris - With age, in other words? Clifford - With age or with intervention by doctors who give immunosuppression to control certain diseases. Chris - What about lifestyle? What if someone has a disease that knocks their immune system back a bit? Say, being alcoholic, having heart disease, kidney disease or homelessness, HIV? Clifford - You're quite right, all these things tend to make you more likely to the disease. I think it's to do with two things. One is exposure, i.e. if you live in a very overcrowded place you're more likely to be in close contact with people who might pass them to you. The other thing is whether or not you're malnourished or you've got a depressed immune system like an alcoholic or if you've got HIV. Chris - How do we actually treat TB? It's bacterium, presumably it's just antibiotics? Clifford - You obviously need to make a diagnosis first. You hopefully will be able to grow the germ and usually in the UK we expect to be able to find which antibiotic the bacterium is sensitive to. Usually it's four drugs. The treatment is four drugs for the first two months, followed by another period of four months with two drugs. Chris - That's a pretty profound regimen. Most bacterial infections, you get antibiotics for five days. Why do we need four drugs for six months? Clifford - That is a very important question. We have got a lot of bacteria, a big burden of infection and we've got bacteria that multiply rapidly. There's a small group of bacteria that grows very slowly. Therefore you can only kill the bacterium when it's growing and if it's growing very slowly you need a long time to give the antibiotics to the patient in order to eradicate the infection. Chris - In the last week or so we've heard of Britain's first case. It's actually here in Scotland, in Glasgow, a form of TB which doesn't respond to those four drugs you mentioned. Where's that come from and why are we seeing more of this kind of thing? Clifford - There are two types of resistance in TB. One is what we call multi-drug resistance and the on case that we mention is an XDR which is extended resistance in TB. The multi-drug resistant TB has been around for a while but this XDR TB which is the very resistant one there are hardly any antibiotics that are used routinely in TB which can be used to try and treat that. Chris - Where did it come from, what made it appear in the first place? Clifford - I think resistance happens gradually over time. We know there's resistance to some of the four components of the drugs we use and when people have more resistance because people have, as you say, the treatment's very difficult to take. You have to take it on an empty stomach, you have to take it daily or at least 3-5 times a week depending on what regimen you use and for a long period of time. Chris - You think poor compliance of people, because the drugs are unpleasant and have this rather difficult regimen, people will drop off the wagon for a while, this means they don't treat the infection properly and then the bugs learn to become resistant? Or you select out resistant bacteria that they're carrying? Clifford - Yeah, that's true. First of all you need to make sure as resistance emerges that the four drugs you're using are the right drugs. Places where it's less resource-rich like in South Africa there is no sense of testing. If you use the standard treatment you're losing some of the drugs if it's resistant already. Patients don't take the course of treatment completely, there;s recurrence and there's also resistance. If you've got resistance already and then you start getting more resistance when you treat again then you lose all the drugs that you have against the TB. Chris - Are most of these cases not homegrown? They're imported to this country from other countries? Clifford - Exactly. We only have one case, the first that came in the UK in Scotland. We have had some MDR TB which is resistant but not as resistant as the last one. They have been all imported from somewhere else. Chris - What's the long-term prognosis here with TB? The numbers look pretty scary. About a third of the world's population are now carrying it. Clifford - True but in terms of the most cases of TB treatment is very effective if you can make sure that he patient is taking the therapy regularly. The places where you can't trust patients to keep therapy will get what you call DOTS which stands for directly observed therapy. That's a good way of ensuring that the patient is taking therapy because somebody watches the patient swallow the medication. MDR TB is treatable if we catch it early. XDR TB has a very poor prognosis, unfortunately.